The federal government has released an open invitation for pre-budget submissions from Canadians in advance of the 2016 Federal Budget. The government has not set a date for the finalized budget but it will likely be published before the end of the fiscal year (March 31). Individuals and organizations alike can submit budget priorities online at any time through the Government of Canada website. 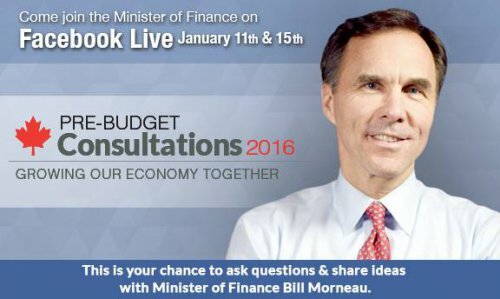 Additionally, starting January 11, Finance Minister Bill Morneau will be engaging with Canadians through online town halls on the Facebook page 'Your Money Matters' and in-person consultations in Halifax, Montreal, Toronto, Winnipeg, Calgary, Vancouver, and Surrey. You can also ask questions and share your thoughts about the pre-budget consultations on Twitter using the hashtag #PBC16. Let's put CED in the federal budget. Submit your recommendations, or draw on the budget proposals the Canadian CED Network submitted before the federal election call last summer.